A Scaramucci is a unit of time equal to 10 days. It’s coined after Anthony Scaramucci, Director of Communications for Donald “I’m going to surround myself only with the best” Trump, who lasted, well, one Scaramucci in that job. It can be shortened to Mooch. For example, I worked about 255 Mooches in my last job (AT&T Labs) before quitting to focus on Wordsmith.org full time. While Scaramucci/Mooch hasn’t yet entered the dictionary, many other words coined after people have. We call such words eponyms, from Greek epi- (upon) + -onym (name). This week we’ll feature five such eponyms, coined after people from fiction, mythology, and reality. Do you have something to share about a short stint at work or elsewhere? Post it below or email us at words@wordsmith.org. No matter how short it was, don’t feel bad -- mayflies last only 0.1 Scaramuccis. And that’s their whole lifespan, not just time at work. Imagine fitting everything -- your terrible twos, teenage tantrums, semester abroad, adult responsibilities, and midlife crisis -- into so little time! Is there a unit of measure you’d like to coin after someone? Share it below or email us at words@wordsmith.org. For inspiration, here are some humorous units to get you started. noun: A boastful coward, buffoon, or rascal. 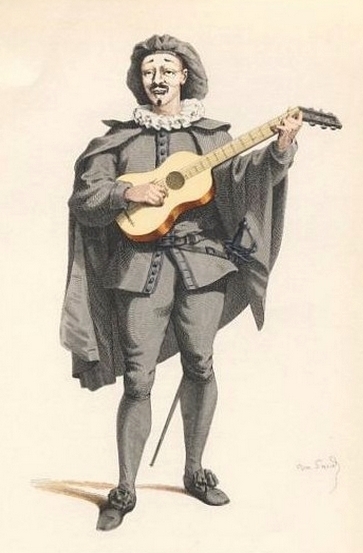 After Scaramouche, a stock character in commedia dell’arte (Italian comic theater popular from the 16th to 18th centuries). His Italian name was Scaramuccia (literally, skirmish) -- he was often getting beaten up by Harlequin. The word is ultimately from the Indo-European root sker- (to cut), which also gave us skirmish, skirt, curt, screw, shard, shears, carnage, carnivorous, carnation, sharp, scrape, scrobiculate (having many small grooves), incarnadine (flesh-colored), and acarophobia (fear of small insects; delusion that one’s skin is infested with bugs). Earliest documented use: 1662. Colin McNickle; Weapons of Mass Redistributionism; Pittsburgh Tribune-Review (Greensburg, Pennsylvania); Nov 5, 2006. See more usage examples of scaramouch in Vocabulary.com’s dictionary.